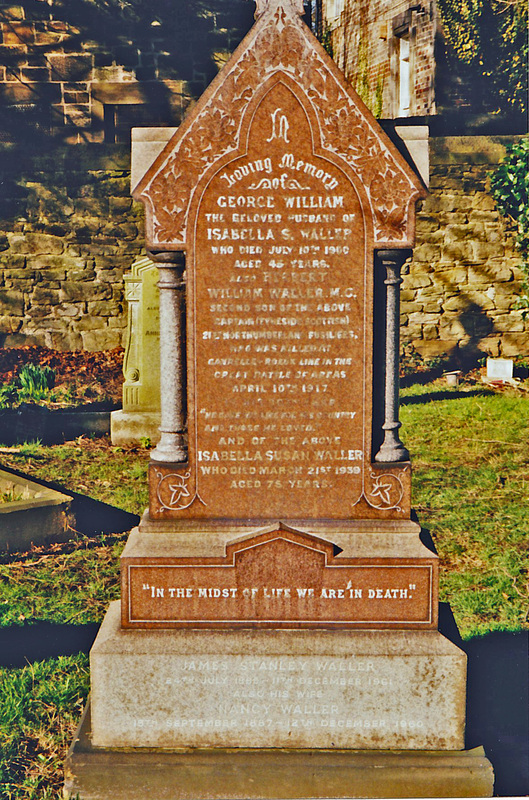 The first part of George Waller’s story can be found here. He received a warm greeting which was not lessened when he mounted his machine. Accompanied by a number of bicyclists, he twice made the circuit of the field and while doing so, he was much admired but he very nearly had a serious accident, as, owing to the roughness of the track, he got what is known as a cropper, which might have done him a serious injury. Fortunately he wasn’t badly hurt and appearances on the track came thick and fast. Waller rode mainly in the North but further afield too. For example, on 4 October 1879, he won a 25 mile race in Coventry ‘ on a 15 inch DHF Premier’. His ‘massive championship belt ‘ and the ‘machine’ on which he won it were exhibited at the ground. On 10 November, he competed in a 100 mile race in Birmingham but retired after 82. And on Saturday 13 December, he competed, riding a ‘Dan Rudge’ bicycle , at the same distance in Nottingham. Closer to home, there were races in places like Sunderland, South Shields, Darlington, Middlesbough and York. The champion was also honoured by local fans and patrons. On 24 March 1880, a ‘testimonial’ was held in his honour at ‘Mr W Gilroy’s Three Crown’s Inn, Buxton Street, Newcastle’. Waller was presented with a purse of gold containing upwards of £70, which had been collected by ‘his numerous admirers in the North’. However, he didn’t join his rivals in March 1880 on the starting line for the following year’s 6 day Championship but instead appeared later the same month in a six-dayer, which he himself had organised, in his home city of Newcastle. It’s interesting to see where the races took place. An early favourite in Newcastle was Northumberland Cricket Ground on Bath Road. And increasingly Waller began to make public challenges to other riders. His offer in 1880 to compete in a six day contest ‘ against any man in the world ‘ … ‘for any sum over £200 a side’ was reported at least as far afield as Cornwall. And riders challenged him to take part in shorter distance races, where they had a better chance of winning. There were always considerable sums of money at stake and Waller won more than his fair share. Often in shorter events, he negotiated a start for himself and he’d grant his opponent one over the longer distances. Waller was clearly aware of his own value to the events he promoted. While he did compete on many occasions, even when he wasn’t fully fit, he would ride a number of exhibition laps or show his bikes and medals. And he usually announced he’d be riding, even when he didn’t in the end appear. Throughout and beyond his career, he was referred to as ‘world champion’ never ‘ former champion’ or ‘one-time champion’ even though he didn’t attempt to to defend his 1879 title. Thus from the outset, he showed a commercial acumen of which today’s agents would be proud. Later, there were many announcements of his ‘farewell ride’ in this town or that. Again, this wouldn’t have done the gate money any harm. 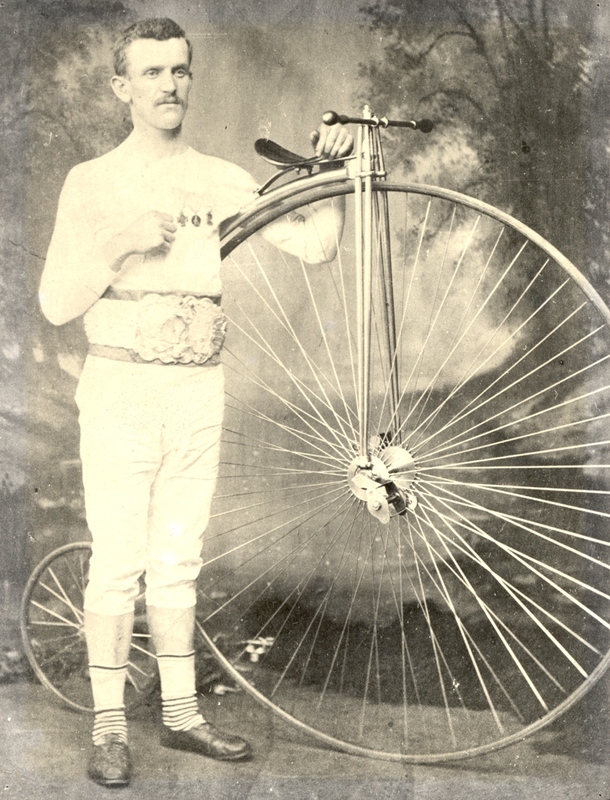 Increasingly though, Waller turned his attention to the promotion of cycling. He continued to ride but also arranged races at a variety of venues, mainly in the North East but also the North West, Scotland and the Midlands. On 23 July 1881 Waller’s own ‘Bicycle and Recreation Ground’ at Dalton Street, Byker, was opened ‘under the most favourable auspices’ . The Journal on 10 April 1882 referred to ‘Waller’s Bicycle and Recreation Grounds, Byker’ (Incidentally the same day’ s newspaper carried a report of events at Heaton Bicycle and Recreation Grounds ‘these popular grounds’). An advert a few months later for a race between Waller and his rival John Keen ‘of London’ gave the entry fee as 6d or 1 shilling and made play of the fact ‘ Byker tram passes the grounds’. They would have been horse-drawn trams, a service which had begun in Newcastle just three years earlier. The popularity of the events were indicated by the fact the gates were to open an hour and a half before the race ‘to avoid any unnecessary crush’. There are rumours to the effect that at night the tent will be illuminated by the electric light. Daily Gazette for Middlesbrough, 15 September 1881 – amazing given that Swan had invented his lightbulb and William Armstrong’s Cragside had become the first house in the world to be lit by electricity only 3 years before. It must have been an amazing site to the average spectator. It wasn’t all about the cycling. At the annual gathering of the Ancient Order of Foresters at Crystal Palace in August 1882, the programme, in addition to the cycling in which Waller competed, included ‘acrobatic, musical and comical entertainment’, cricket, processions, ‘aquatic fun’ , dancing, and a balloon ascent which ended in near disaster. ‘Wanted – good brass band’. And there was an application in July 1881 for a licenceto serve alcohol in booths owned by him ’in a tent to be used for bicycle contests’ opposite the Royal Agricultural showground in Derby. Novelty races included one in Gateshead between Waller on a bicycle and ‘Blue Peter, a roan trotting horse, driven in a sulky by Mr Rymer of Manchester.’ On this occasion the horse was the victor. It’s possible that Waller, like a number of his contemporaries, also competed overseas. In November, 1881 a farewell ride in Sunderland ‘before leaving for America’ was reported by Sunderland Daily Echo and Shipping Gazette. So far, we haven’t found any documentary evidence that Waller rode outside Britain and, if anyone has further information, it would be great to find out more. In September 1884, Waller was present at the opening of Byker and Heaton Conservative Working Men’s Club and the same November he ‘admirably ‘ replied to the toast of ‘Professional Cyclists’ at Jesmond Amateur Cycling Club’s fourth annual dinner. By this time, he seems to have retired from participation in the sport but continued to officiate. But when, on April 1889, the new Bull Park bicycle track was completed at what is now Exhibition Park, George did a test run and declared it one of the finest in the kingdom. 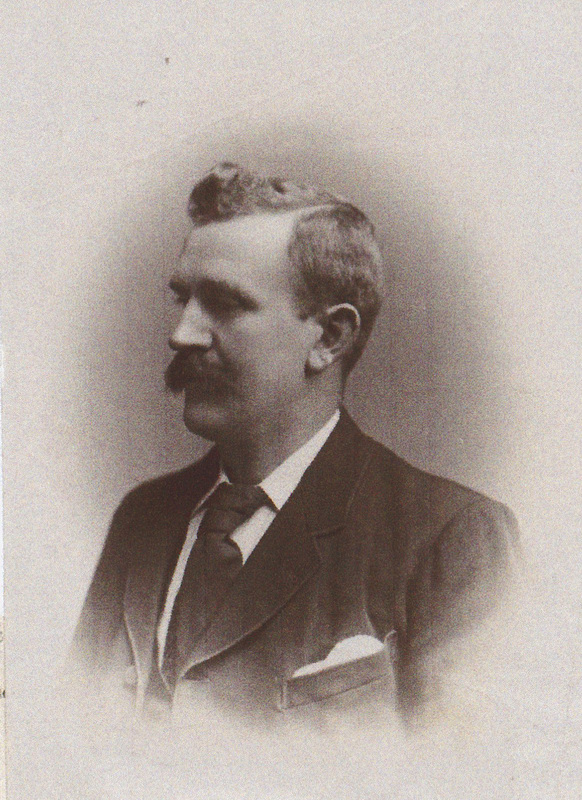 Waller had started his working life as a mason and his prize money had enabled him to start a construction business in Albion Row, Byker, with his brother Henry. It seems to have been extremely successful. Newcastle was expanding rapidly and in July 1896, he advertised far and wide from an 87 Raby Street , Byker address for bricklayers to be paid 10d an hour. Ironically, however, the first real evidence we have of Waller’s success in this field came with tragedy. On March 6 1897, the North East Daily Gazette reported that four men had been killed and nine others injured when a public house, called the Green Tree, on Sandgate ‘ one of the most antique of houses…said to date from the time of Queen Elizabeth’ , which Waller had bought to renovate, collapsed while eighteen of his men were working on it. By this time, Waller is described in the newspaper not as a cyclist but ‘a well-known builder in the city’. A few months later, the same paper reported a court case in which Mrs Jane Brogden, wife of one of the men killed, sued Waller for damages. She was awarded £225 compensation. In the late 1880s, the champion was living in Waller Street. (Did he name it himself or was it an honour bestowed by someone else?) But by 1890, he had moved to Heaton. It was common for builders to move in one of the new houses they had recently completed and so there is circumstantial evidence that Waller’s firm was responsible for building locally. He lived first of all at 78 Heaton Park Road and then at number 92, a house next door to the photographer, Edward George Brewis. Heaton Park Road has since been renumbered. Waller’s old house is now number 188. But, ever the entrepreneur, Waller continued to diversify. In August 1898 he applied for a licence to sell alcohol at houses in Raby Street (167 and 179), Byker. On 9 July 1900, aged 45 George Waller was driving in a pony and trap from Jesmond Dene Hall, where he was supervising alteration work, towards his home in Heaton Park Road. 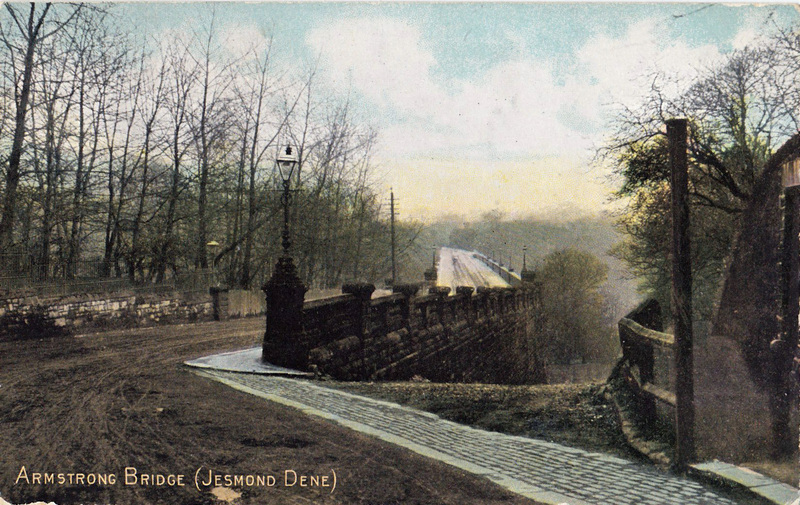 Apparently, as the horse approached Jesmond Road, it reared and turned towards the Armstrong Bridge, throwing Waller from his seat. He was removed to Jesmond Dene House where he died from head injuries the following morning. Waller had been accompanied by a boy called Joseph Cranston of Byker, who, giving evidence at an inquest the following day in Heaton’s Addison Hotel, said he had looked after the pony since Waller had bought it and that it had no history of bolting. George Waller left a wife, Isabella, three sons, James, Herbert (who was to die in France during World War 1) and William. His daughter, Georgina, was born just weeks after her father’s death. The very same day, his death was reported in newspapers right across the country. It was just over 20 years since his most famous sporting triumph. 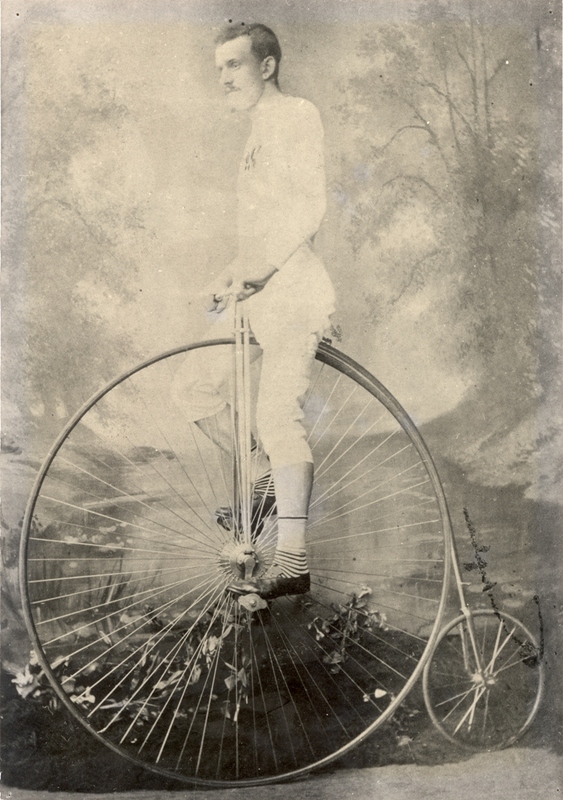 The sport had changed – the reports refer to his success on ‘the old high bicycle’ as if from another age – but he had certainly not been forgotten. 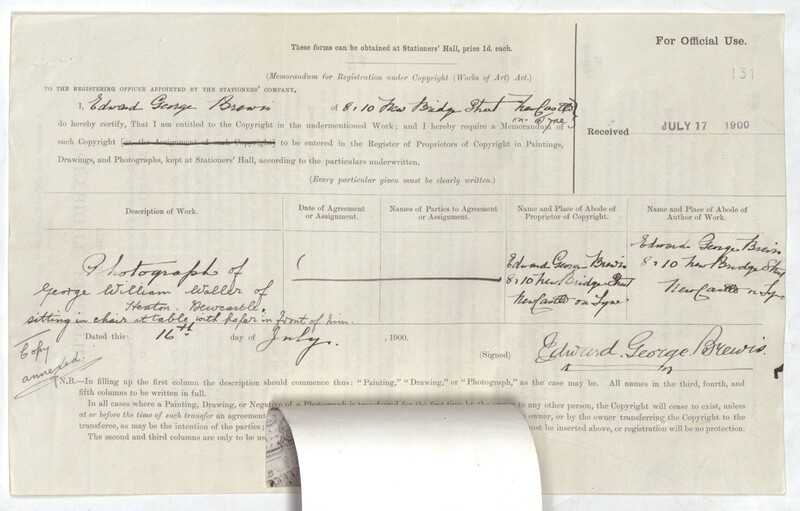 It was while researching Brewis’ story, interesting in its own right, that the document and the photographs came to light in the National Archive – and led to the even more fascinating character of George William Waller. but appears to be the only memorial to him. It would be fitting, during the year the Tour de France comes to the North of England where Waller did so much to promote cycling, to see his championship belt displayed at The Discovery Museum and perhaps a commemorative plaque at his Heaton home . This entry was posted in Research and tagged Addison Hotel, cyclist, Edward G Brewis, George W Waller, Heaton Bicycle and Recreational Grounds, Heaton Park Road, Herbert Waller, Jesmond, Joseph Cranston, photographer, WW1 on May 23, 2014 by oldheaton.